This is one of Baby Lady’s and my favorite pasta dishes. What’s there not to love about pasta, butter, cheese and black pepper? To make it even better, this dish is so fabulously simple. From start to finish (including brining the pasta water to a boil) you have this meal on the table in less than 30 minutes. Now, I’m not a master of pasta or Italian cuisine like Stefan, Stefan’s Gourmet Blog, or John, From the Bartolini Kitchens. Those guys know pasta and Italian food. If you have followed this blog at all, you know I dabble in a little of this and a little of that with a little chile added for extra pleasure. 🙂 I do, however, know a good pasta and this is one good pasta. In fact, this pasta dish is perhaps best considered the Granddaddy of macaroni and cheese but a whole lot simpler and quicker. Like most everybody, Baby Lady and I love the combination of pasta and cheese. This combination of flavors has been around for ages. 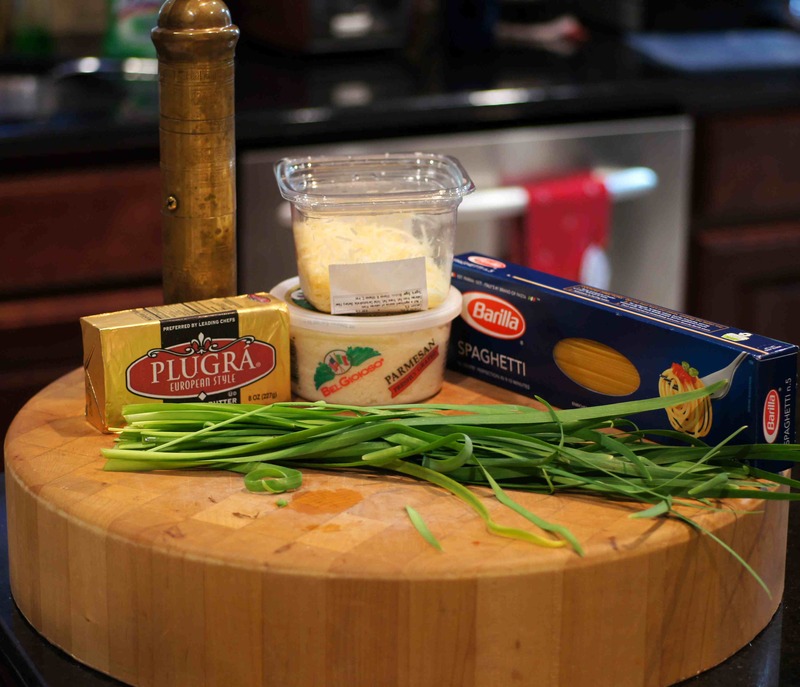 In fact, food historians have traced pasta and cheese dishes back to the 13th Century. Macaroni and cheese is an all-time American favorite found in virtually every diner you visit. There is just something about cheese and pasta that pairs together so well. It’s amazing. 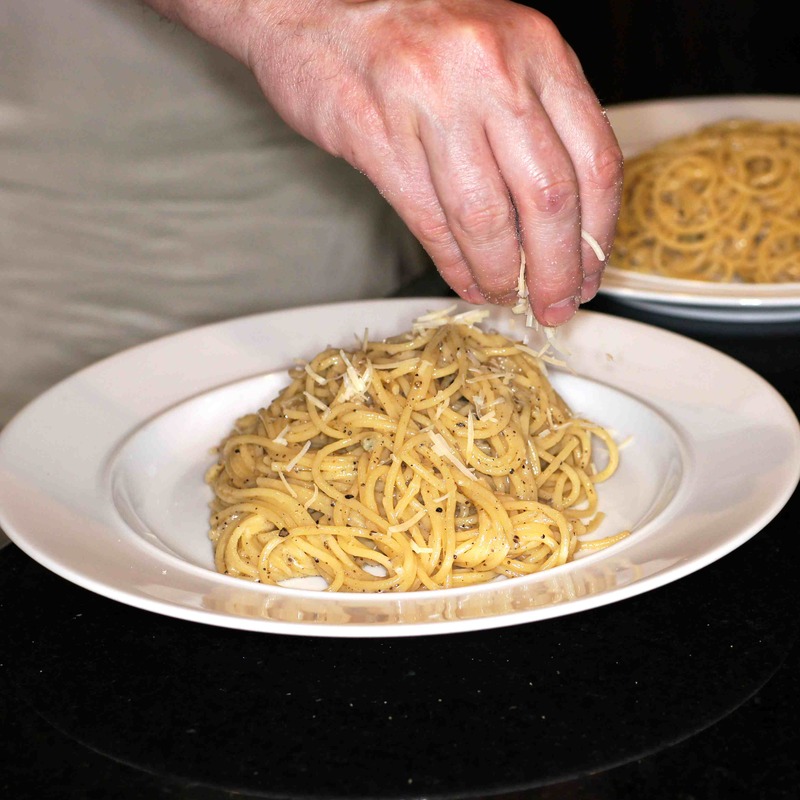 Cacio e pepe, one of the Grandaddies of the culinary arts, literally translates cheese & pepper. You can’t get much simpler than that. It has its origin in Rome and, as I understand it, is found in restaurants throughout Rome. Everybody loves it and I don’t blame them. 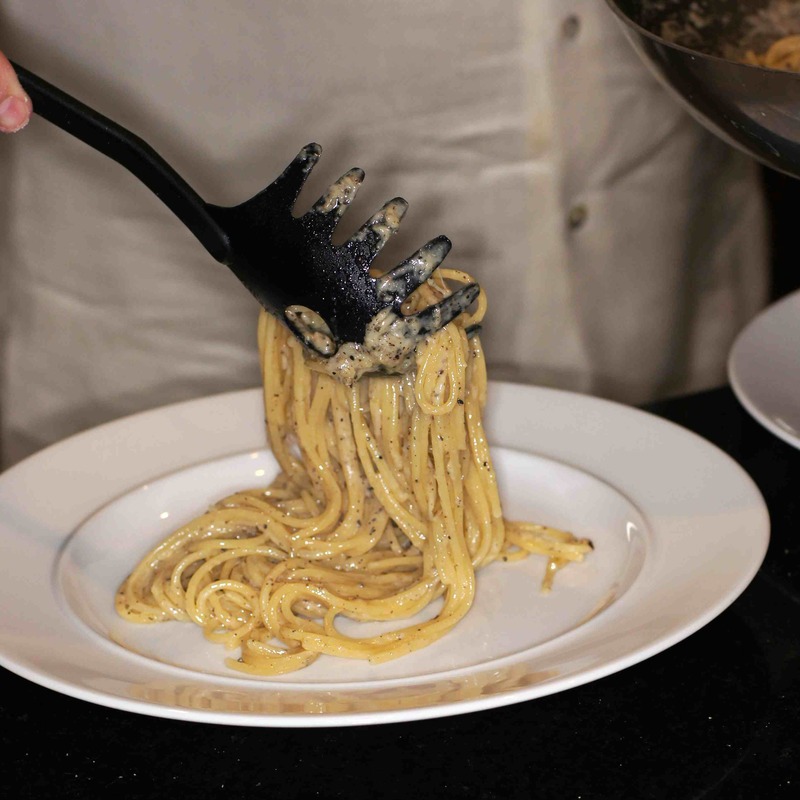 The beauty of cacio e pepe is its delicious simplicity. It may well be the simplest meal ever created yet it is incredibly luxurious and flavorful. Interestingly, for something so simple it’s amazing how many different techniques and variations on the recipe there are. Some use butter, some use a combination of olive oil and butter, others use no butter/oil, only the cheese, pepper and pasta water. 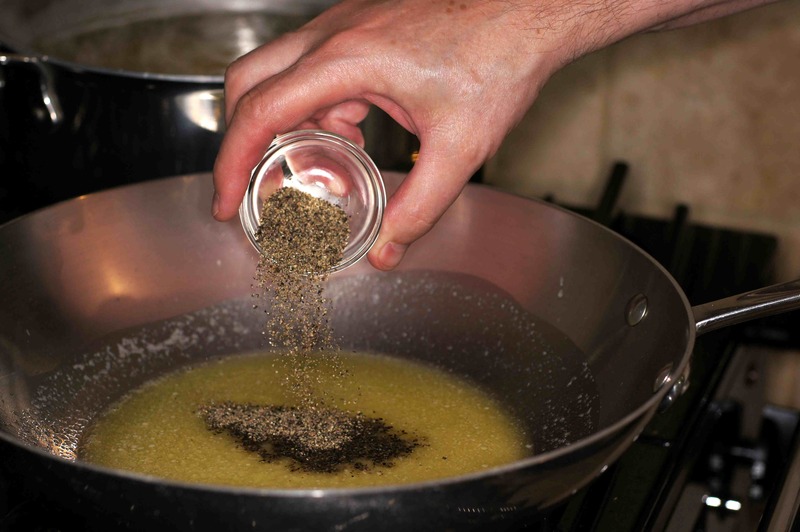 Some toast the cracked black pepper, add the oil/butter then the pasta water to form an emulsification. 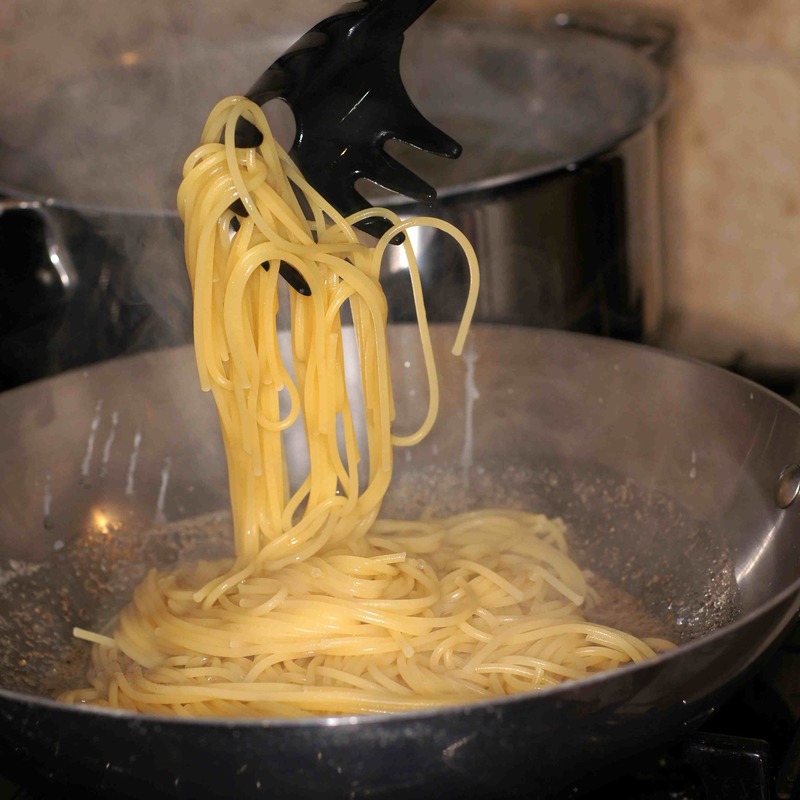 Others melt the butter, add the pepper, then the pasta and then the water. Next, the question becomes which cheese? 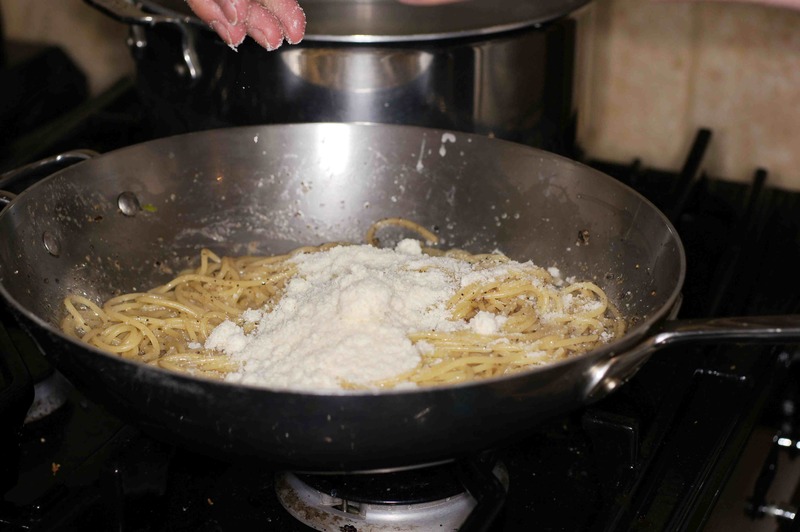 Some recipes say percorino, some say parmesano reggiano, some say a combination of the two. I haven’t even begun to address the various permutations on technique and ingredients for this very simple dish. It’s really fascinating seeing the different approaches to this simple meal. Regardless of the technique, fat versus no fat, or choice of cheese, the critical aspect of this dish, however, is the sauce. If done improperly you get a lumpy, gloppy, cheesy mess. Done right, on the other hand, you get a luxuriously creamy, cheesy sauce mixed with the pasta that has lots of pepper flavor. It is so good, you just can’t stop eating plateful after plateful. You will be amazed that something this simple and quick can taste so good. 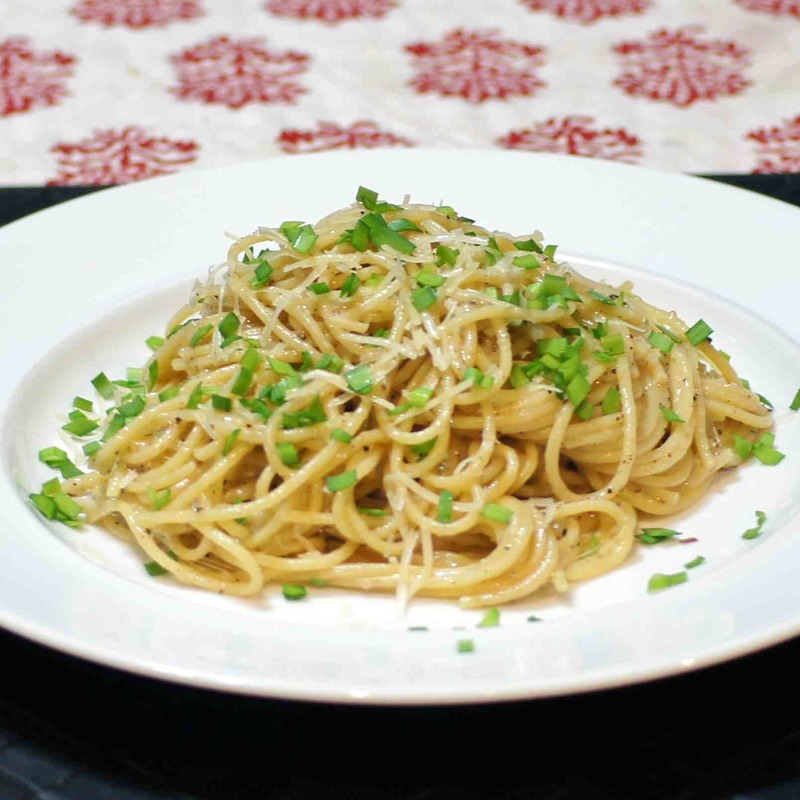 If you have never had cacio e pepe, you need to try this dish. This is what we did. 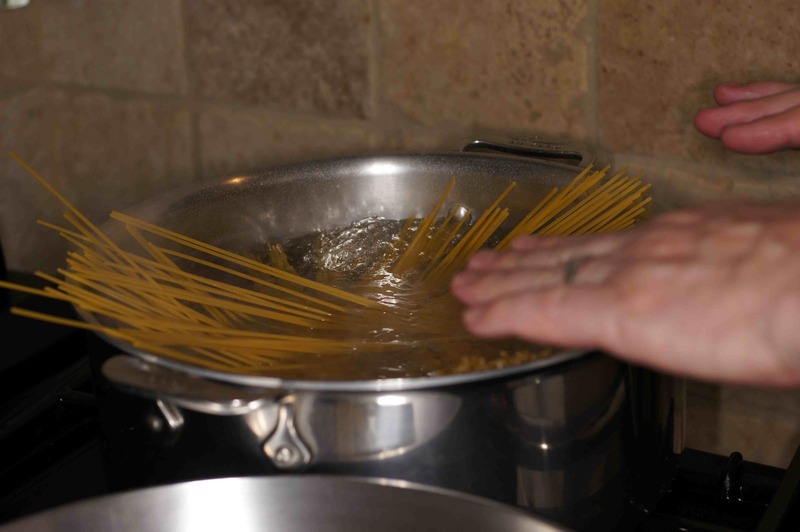 Bring a pot of salted water to a boil and add the pasta. Cook the pasta until it’s almost done. 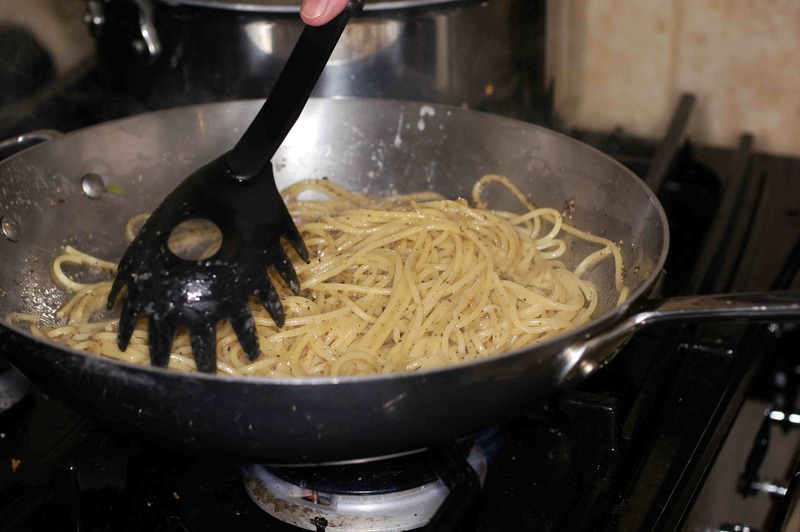 You are going to finish cooking the pasta in the pan with the sauce. 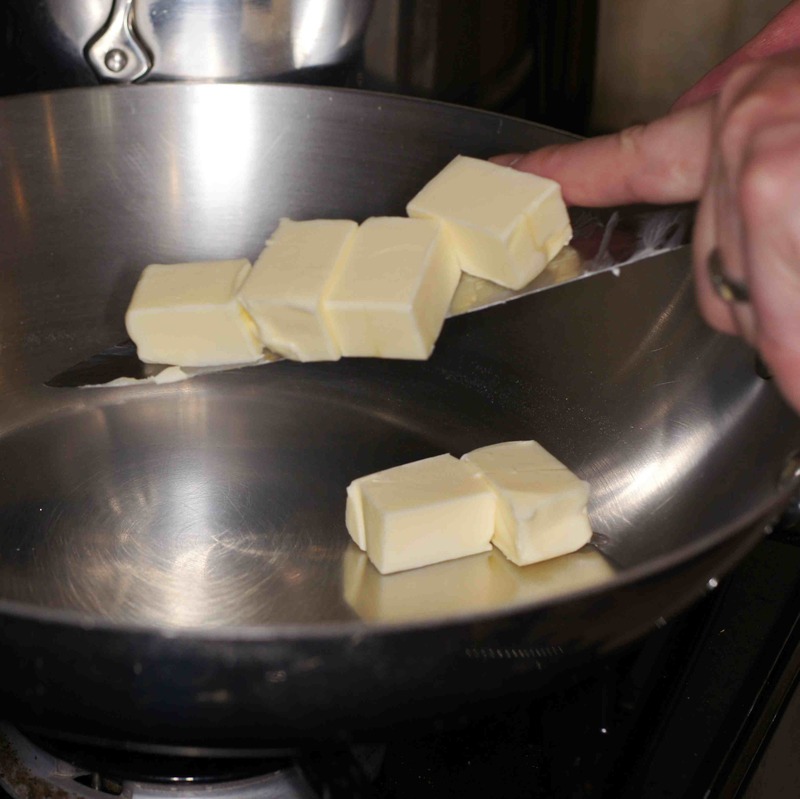 Melt the butter to a creamy consistency and add the pepper. Now, add the pasta to the butter and pepper. 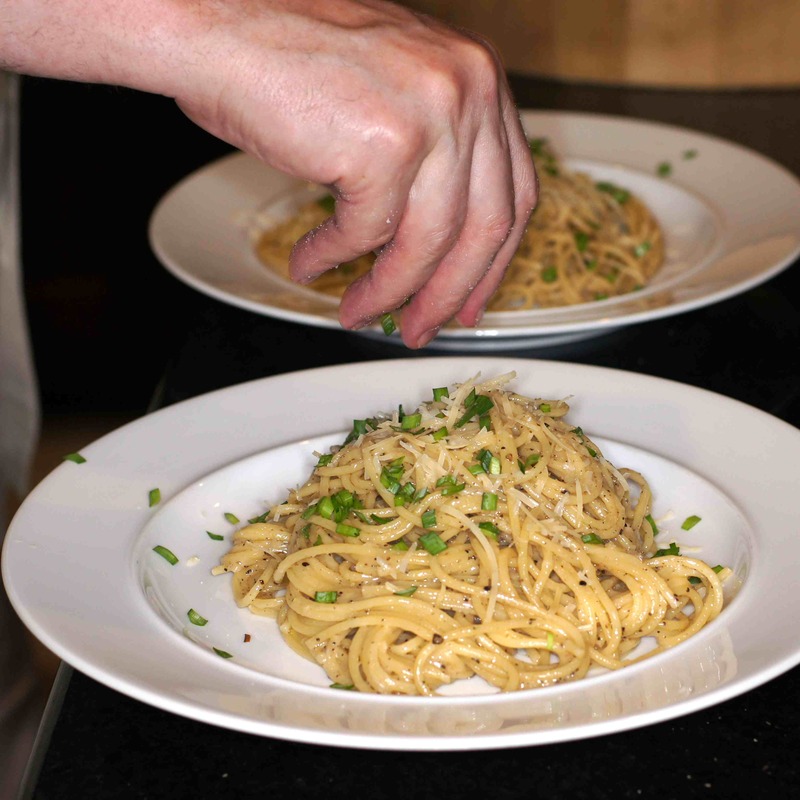 toss to incorporate the butter and pepper with the pasta. Now add the pasta water. 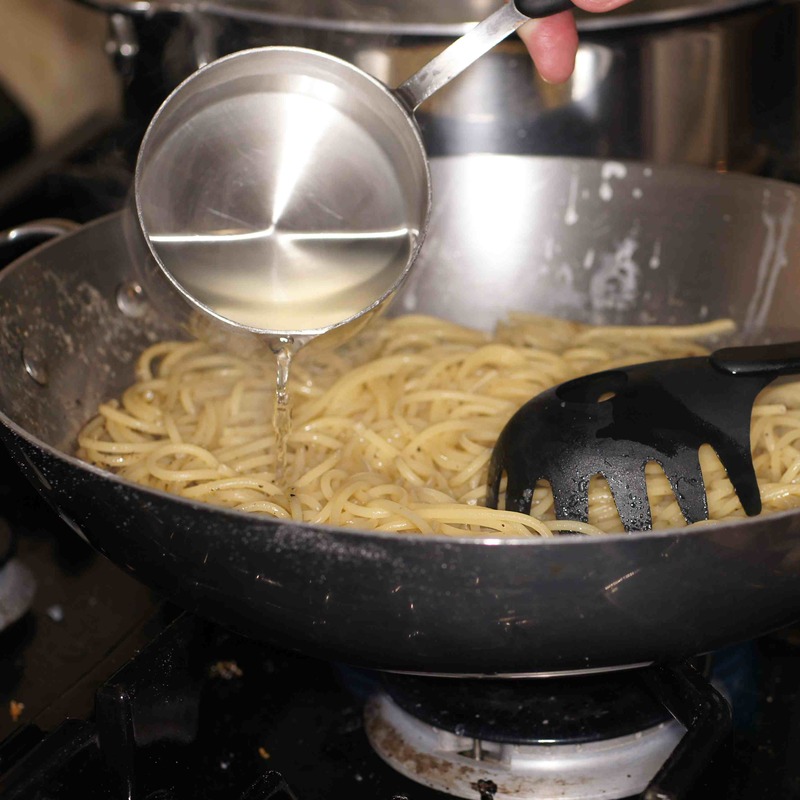 Toss/stir the pasta and finish cooking the pasta while the water evaporates. Do NOT evaporate all of the water because the water is going to help melt the cheese and form the sauce. When 70% of the water has evaporated (roughly 60 – 90 seconds), remove from the heat and add the cheese ALL AT ONE TIME. The residual heat is going to melt the cheese. If you add a little bit by little bit the cheese will clump. Toss/stir to melt the cheese and form the sauce. Now, plate. Add a little extra parmesan cheese. Serve with a nice glass of white wine and enjoy. You can’t get much simpler or better than this. Gulp! I love this already. Being a pasta girl, I take anything with pasta, except marinara sauce. But the simple it is, the flavorful it must be. Hi Richard, when I saw the title I thought “He wouldn’t add chiles to this, would he?” and I’m glad you didn’t 🙂 From the photo it looks like you managed to get just the right consistency, which can be a bit tricky. Perfect! As a purist, I make this without butter and without chives, and with pecorino romano for the cheese (although I cheat sometimes and use pecorino sardo or toscano just because good pecorino romano is hard to find around here). Hi, Stefan. Thanks for the compliment. No chiles in this one. It’s perfect as it is. Not even Baby Lady wanted chile and it’s Hatch chile season. 😉 We really add the chives for color but I do like the slight flavor imparted by them, as well. Lunch is my main meal, so I am about to be off to that ‘second one’! This will do just great 🙂 ! Simple and foolproof with just a tad of ‘je ne sais quoi’ we’ll find out in about ten minutes . . .:D! Hi, Marie. Thanks for your nice compliment. 🙂 This is a fabulously delicious pasta. Guaranteed not to disappoint. Sounds wonderfully delicious; often simple is best. This is one of those dishes that is so easy to prepare and loaded with flavor. This is truly my idea of a comfort pasta….I have never made it but you better believe I will! Perfect looking texture and consistency. I don’t know what it is about pasta and cheese but they are made to go together! Love this simplicity of this dish. I could eat a whole big bowl of it! Lovely recipe Richard. Stefan’s comment above made me laugh about you and chilis. We cooked the 5th in the Dublin goes DFW series last evening. I am loving the range of flavours that the various chilis impart. Stefan is right though, not in this classic (that you do very, very well). Now you’re talking, Richard! This is a great recipe, one that’s been a favorite of mine for decades. It’s the aroma of cheese and pepper. That scent intoxicated me as a boy and nothing has changed since. It’s still my “go to” dinner when nothing else appeals. You’re very welcome, and I can just imagine! I can taste it from here, Richard! This was my Dad’s absolute favorite way to have pasta. Sometimes the greatest sauces in the world can’t beat the simplicity and perfection of the main ingredient and the lack of need for supplementing its innate flavor.